This 3 part series is guest blogged by Jim Hiserman. Click here for part 1 yesterday. Here are the 3 most common questions I am asked along with brief answers to those questions. 2) How Do Coaches Determine How Long To Use Extensive Tempo Before Moving On To Intensive Tempo? In most cases, the length of the Preparation Phase will determine how long Extensive Tempo can be used before moving to Intensive Tempo. The normal progression would be Extensive Tempo > Intensive Tempo > Special Endurance I and II > Specific Endurance. Using a typical High School program where training is allowed from Dec. 1st with the first meet scheduled the first week of March will have roughly 12 weeks before the Competitive Phase. Coaches could progress their Extensive Tempo Training by 100 to 200 meters per week for 4 weeks before making the transition to Intensive Tempo for 4 weeks. Four weeks would be the minimum time for training adaptation to occur. This would allow for 2 weeks of Special Endurance I, II work to take place before the week of the first Competition. If coaches see the need for greater physical adaptation to Extensive or Intensive Tempo, then they could opt for 6 weeks of each and start the Special Endurance I, II work during the first week of the Competitive Phase. In any case, it is wise to start training with Extensive Tempo and progress to Intensive Tempo training before Special Endurance I, II training regardless of training time limitations before the season begins. 3) How Many Days Per Week Should Extensive Tempo Training Be Used In The Preparation Phase? I personally use Extensive Tempo twice a week. Using Metabolic Training Days after Neural Training Days is the proper method for sequencing training days of the week. This means using Extensive Tempo on Tuesdays and Thursdays when Mondays and Wednesdays are devoted to Neural Training methods. If Wednesdays are used for Recovery activities, then I schedule Neural Training Days on Monday and Thursday with Metabolic Training days on Tuesday and Friday. It all depends on the amount of days each coach has to work with. As a general rule, coaches should not schedule back-to-back Neural Training (Speed/Strength, Elastic Strength) days. Extensive Tempo Training provides excellent recovery/ regeneration from Neural Training while also developing the foundations for Energy System development. 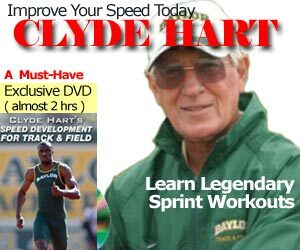 I use one day for Extensive Tempo “A”for developing Aerobic Power (100 up 200m reps at 70-75% of 150m T.T. times) and one day for Extensive Tempo “B” (250 up to 500-600m reps at 60-69% of 300m T.T. times) for developing Aerobic Capacity.